Japan prides itself for its originality in architecture, which has developed very differently from the techniques in other countries. The roof tile is one of the original distinctive features shown in Japanese architecture. The roof tile helps us to live comfortably even during the humid weathers, and it is easy to exchange the tiles when they a broken by bad weather conditions such as hurricanes. There are many merits in using this roof tile called “Kawara”, but other than that, it has develop to be more artistic and to vary in design. 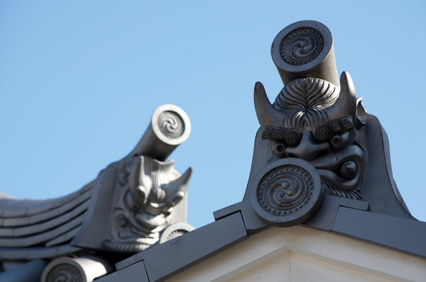 Today we would like to introduce you the “Koushu Kimen-Gawara”, a traditional designed roof tile which shapes the face of an “Oni”, a traditional name for an ogre. This particular roof tile gives a very strong impact to those who sees it. What is “Koushu Oni-Gawara” ? Koushu Kimen-Gawara is a roof tile which shapes the face of an ogre by using special techniques, and it is often displayed as a guardian of that house. It is said that this particular type of tile was born more than 100 years ago, and developed rapidly during the Edo period along with the expansion of the production technology. Since then, these tiles were used for the roof of castles, and it became a widely known industry. It specializes in its unique design, for each and every tile is handmade. By doing so, each tile is similar but not exactly alike and there is a slight difference in its expressions. Koushu Kimen-Gawara is made from a very sturdy material compared to other tiles, to last long. The use of Japanese tiles has decreased due to the increase of western style architectures, but despite that, Kimen-Gawara is still loved and small sized tiles are very popular for souvenirs. Koshu Kimen-Gawara differs in its quality by the material used to make the tile. Kikuma tile in particular, is famous for its sturdiness and it used for many types of architectures. Kikuma tile is not only sturdy, but it is durable against humidity and rain which keeps the roof from degradation. It is also famous for its high insulation, and keeps the room warm and prevents the room from being heated up by the sun. It is assumed that Kikuma tile is fit for Japan’s climate of high temperature and humidity. Kikuma tile is also well known for its beautiful oxidized silver color after being baked. This stylish color gives an unique touch to the roof. The practicability and the beautiful color of Kikuma tile is one of a kind. Kimen-gawara is a special tile which is made in a shape of an “Oni”, a legendary creature in Japan. It has fangs and horns and it is often described as a monster. There are many traditional tales and myths about them from a long time ago, and those tales and myths varies in the area. Some say that Oni brings disaster to people, but somehow Oni is considered as a guardian in the history of Kimen-gawara. The reason for this is not sure, however it is said that the root comes from a foreign culture which was brought to Japan by the silk road. In Palmira, there is a culture of displaying a talisman which shapes the head of Medusa, and it is assumed that Japan’s Kimen-gawara was made in reference to the culture in Palmira. Although being well known as one of Japan’s traditional crafts, there were times when it faced a time of declination. After World War Two, many western style architectures were brought to Japan, and there were less use of Japanese roof tiles. The roof tiles gradually reduced their production, and among that the population of the craftsman decreased because of age, and the population of young craftsman was very small. During 1989, the last company making the Kimen-gawara closed, which lead to a serious danger of etiolation. Soon after, many activities were taken to spread the skills to the younger generations, to prevent the extinction. As a result, Kimen-gawara was spread to be known worldwide, as Japan’s representative traditional craft. There are less people who builds a Japanese house nowadays, but even so Kimen-gawara is still keeping its production line. New tiles are used to replace the old ones to fix the broken rooftop of the houses, and handy types of these tiles are a popular souvenir. Many variations of these tiles are made for many purposes, and especially the souvenir type of small tiles are very popular among foreign travelers. Although the opportunity to use them for architectures have reduced, Koshu Kimen-gawara and Kikuma Gawara is still loved as a famous traditional craft and is keeping its popularity by changing the variety of products. You may find some factories where they let tourists experience the making of the Kimen-gawara, so feel free to stop by to enjoy the beauty and art of the Kimen-gawara.